The Mini Sheller is one of four main residential pea/bean shellers that is offered on the market today. The Mini Sheller is the second largest pea sheller available for home use. At up to 4 bushels an hour, it is perfect for large gardens to small farms. 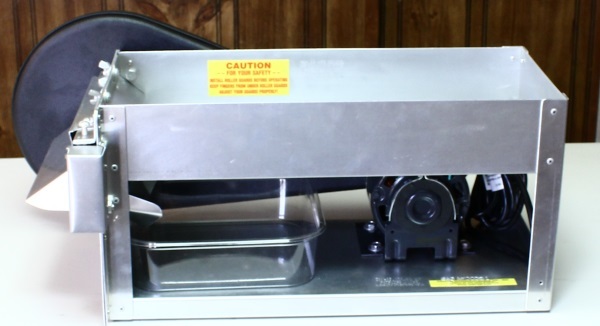 The Mini Sheller can easily shell black-eyed peas, crowders, purple hull peas, lady fingers, white acres, English peas, and even mature butter beans. Southern Garden Tools saw a need for a sheller that would be able to handle any home gardener's harvest, be easily transported by one person, and be stored without taking up much needed room in a home. We personally requested Taylor Manufacturing to begin designing a pea sheller that fit these needs with the same quality and experience that was used to design and manufacture the Little Sheller. Taylor Manufacturing, located in a small town in South Georgia, has been perfecting the pea/bean sheller design for over 53 years. Since 1959, Taylor Manufacturing has made pea shellers of the highest quality materials and design. 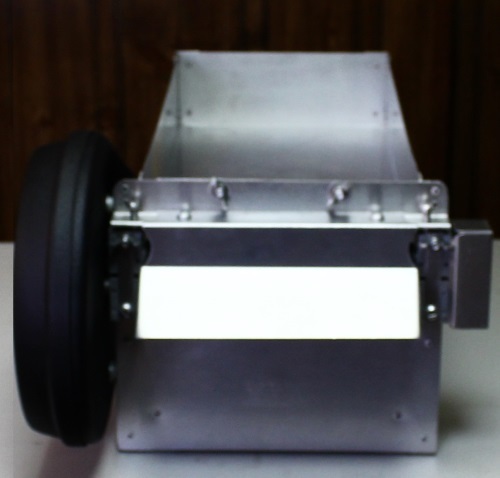 Using this experience at our request, the Mini Sheller was recently produced and made available to us. When presented with the Mini Sheller, we knew we had found the Sheller we had been looking for. Place bean or pea pods in the top tray. For best results, flatten all pods to one level and face them the same direction. With your palms, push gently the pods to the rollers until the rollers grab the pods and pull them through. The shelled peas/beans are dropped into the waiting tray and the pods are ejected out the front of the machine. After extended use, pith from the pods will collect on the rollers. This is not mashed peas or beans. The pith will need to be wiped off to ensure that the bottom roller is still able to twist the pods easily. Also if you notice black streaks on the rollers, these are non-toxic and caused by a chemical reaction between the pods and the neoprene rollers. This is much easier to remove when moist and could be done when pith is being removed. Also if used continuously throughout the day, oil once or twice that day the shaft bearings with light mineral oil. Usually there are no problems shelling peas or beans fresh from the garden or field. However sometimes if you are having difficulty in shelling peas or shelling beans, you can prepare the pods before using the Mini Sheller to ensure that you have the highest yield possible. If recently picked, the first thing is to allow your pods to mature overnight. If you are still having difficulty, then you can try soaking the pods in water a few minutes before shelling. 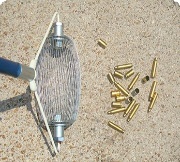 The Mini Sheller can shell pods when wet so no need to dry off the pods before shelling. Also always make sure that pods are at room temperature when shelling. The adjustable rollers are the key design behind the Mini Sheller being able to easily shell so many different types of peas and beans. With easy adjustments you are able to shell different thicknesses of pods. First you need to remove the front roller guard with a flat-headed screwdriver. Now you are able to see the two rollers and the clearance between them. Also you will see a wing nut on each side of the rollers. These hold the bearings in place to not allow much roller movement while the Sheller is in use. The wing nuts will need to be loosened to allow adjustment. There will be one screw above each wing nut. These screws can be adjusted using a flat-headed screwdriver. They adjust the height of the rollers. If you adjust the rollers to too great a height, the pods will not open. Too tight an adjustment and the peas and beans will end up mashed. After adjustment, the wing nuts need to be retightened. If they are not tightened, the rollers will be loose and cause stress on the bearings which will wear down and need to be replaced. After the wing nuts are tightened, then you can screw the front roller guard back in place. The overall size of the Mini Sheller is 23.5 inches in lengh, 14.5 inches in width, and 10.5 inches in height. The bed size that holds the pods is. The total weight is 13 pounds. At this low weight, you can easily transport the Mini Sheller under your arm from your shed to the garage. The frame is all durable aluminum. The gears and shafts are steel, and the rollers are neoprene. The motor is 1/10 hp and is fan cooled with thermal protection against overheating. The motor was designed specifically to match the torque and speed of the rollers. If the rollers are moving too fast, peas and beans end up smashed. If the rollers are moving too slow, the pods are not grabbed. Due to this design, the Mini Sheller can handle up to 4 bushels per hour without overheating and is made to last for years. All parts were manufactured, designed, and produced in the United States. There are safety guards for the rollers and belt attached to the sheller. These guards should always be attached during use and should only be removed when cleaning. The safety guards protect the rollers in the front and exit. This ensures that hair and hands do not get caught in rollers during use. In particular, these guards make using the Mini Sheller a more comfortable experience especially if you have never used a Sheller before. From personal experience with the guards, you will feel no fear when pushing the pods towards the rollers. Guarding the belt and drive wheels is a black guard so all moving parts are protected against accidenal contact. An on/off switch is located on the cord so there is no need to leave the machine running to unplug. Also the cord has a three-pronged plug that is grounded to protect users from electric shock. Depending on use, the Mini Sheller needs to be cleaned at least twice a season. The frame and rollers can be cleaned using dishwashing soap and water. When cleaning the Sheller, do not allow water to get into the motor. If you need to clean the bottom of the Mini Sheller, I recommend a wet wash cloth. You can clean the motor with a dry cloth or paper towel. After cleaning your machine, re-oil the shaft bearings, gears, and motor with light mineral oil. Without shelling, run the machine a few minutes to prevent rusting of the roller shaft. This also ensures that the oil is distributed equally throughout the motor. At the weight of 13 pounds, when shelling season is over you can easily store your Mini Sheller on a shelf or in a closet.